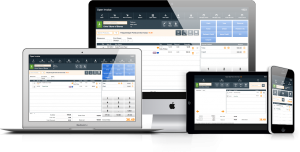 Your PayGo software is designed to keep all aspects of your business running smoothly, and naturally that extends to your ordering. With PayGo, you are able to create & commit purchase orders, add new inventory, and ensure that your store is always stocked with your most important items, all in one simple-to-use place. All information on purchase orders can be found on your central Purchase Orders screen, accessed via the Menu button. You can create a new purchase order by clicking the New Purchase Order button, or you can click the Plus button next to the Purchase Orders button on your Menu. Both methods will open the Order Creation – Purchase Order screen. If you’re looking for a previously-created purchase order, you can search for it in the Purchase Orders screen by clicking the List Open POs button at the top of the screen, or by searching for the purchase order in the Search bars to the left of the screen. You can also search for purchase orders by clicking the Magnifying Glass button next to the Purchase Orders button on your Menu, which will open a search window. Note: For more information on creating and committing a purchase order through PayGo, see Creating a Purchase Order. Close: This button will exit out of the screen and bring you back to your central screens. Your work will be saved automatically. PO Central: Clicking this will open your central Purchase Orders screen. New Vendor: Clicking this button will bring you to the Vendor/Consignor/Manufacturer Entry screen, where you can add a new vendor to your PayGo software. New Inventory: This button will bring you to the Inventory Quick Add Screen, where you can add new inventory to PayGo. For more information on adding items, see Adding Inventory to PayGo with the Inventory Quick Add Screen. Items Needed: If you have added a vendor to the Vendor Information box, this button will open the Find Screen where you can check if you have any items from this vender that need to be reordered, as based on their set minimum and maximum inventory counts. This can be changed or added via each inventory item’s Product Screen. For more information on the product screen, see Product Screen – Basics. All Items: If you have added a vendor to the Vendor Information box, this button will open the Inventory Items search screen, where you can see a list of every inventory item you purchase from that vendor. Commit PO: This will post the purchase order and change its status to Waiting to Receive Order. The Order Info tab is where you can enter details about when the order has been placed, when it should arrive, which store the order is for, and information on any possible order cancellation. In the Ship To tab, you are able to set where the purchase order is being sent. And in the Bill To tab, you can set who will be paying for the purchase order. If you have an invoice through PayGo that you’d like to link to the purchase order, you can add a link to that in the Invoice Link field by clicking the blue Check Mark icon to the right of the field. When an invoice ID is added to this field, you can click on it to automatically open the invoice in a new window. The items on your purchase order will appear in the list below. Qty: How many of the item you would like to order. OnHand: How many of the item you already have onhand. OnHold: How many of the item you have on hold. QO (Quantity Ordering On? ): This will indicate if you have quantity ordering for the item on. This feature can be set in the item’s Inventory Screen. Matrix: if you have set the style in the Style column, clicking the Matrix button in this column will create a matrix displaying all items in your software within that style. You are able to add items to your item list from the matrix. Style/Size/Color: These three columns will indicate the item’s style, size and color. Vendor SKU: This is the SKU the vendor has specified for ordering. Item Name: The inventory item’s name. Cost: This is the vendor’s cost for the item. Disc (Discount) %: If you get a discount for this item, you can enter it here in the form of a percentage. Disc: This will show your adjusted cost based on the percentage discount. Ext Cost: This will display the extended cost of the item based on how many you are ordering. Retail: This is how much you sell the item for in your store. Notes: If you have any notes for this item, click the Speech Bubble icon in this column to add them to the purchase order. Clicking this will open a pop-up box with a field for the Note, as well as a field for the Date Item Expected. Trash Icon: If you decide not to order an item in the list, click the Trash icon at the end of each line item to delete it from the list. Note: If you would like to delete all items from this list, click the Delete All PO Lines button above the item list.